Balkrishna Pandeys Sai Babas 261 Leelas is a handy compendium or, as he calls it, an aide-mémoire of 261 miracles of Shirdi Sai Baba, intended for the devotees. Culled from a number of sources, he has obtained stories from the often hard to find books like Narasimha Swamis biography of Sri Sai Baba, and decades-old copies of the Sai Leela journal. The author does not try and interpret the miracles but lets the reader realise the universal message for himself. 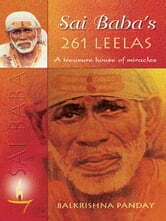 In todays busy world, this work offers a shortcut for daily devotion, offering the reader a quick manual to peruse, ponder or meditate upon Sai Babas micraculous leelas while waiting for a bus or to fill any spare moment --- Dr Marianne Warren ,Author of Unravelling the Enigma: Shirdi Sai Baba in the Light of Sufism This book puts together the authentic and pithy miracles of Sai. All that was verifiable within the first twenty years of the 20th century, directly related to the Saints life has been arranged under scintillating titles, all 261 of them. The readers cannot but be deeply moved by the sentiments of devotion projected by Balkrishna Panday in his writing titled Sai Babas 261 Leelas.